Proponents of Question 2 gathered at Foley’s Irish Pub and Restaurant to watch the election results. 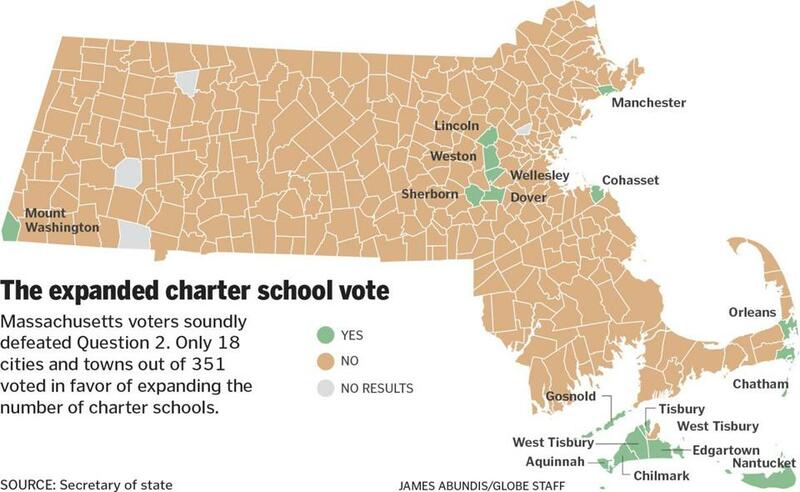 A majority of voters in nearly every Massachusetts community — including all the state’s cities — rejected the ballot question to expand charter schools, exceeding the worst-case scenario of supporters who hoped it would at least pass in urban areas. The trouncing puts the future of the charter-school movement into limbo and raises questions about whether supporters should have taken the issue directly to voters to get around a legislative stalemate, resulting in the nation’s most expensive ballot question campaign ever. And supporters may have lost the chance to go back to the Legislature to pursue another lift in the state’s cap on charter schools — at least anytime in the near future — as legislative leaders expressed little appetite to take it up again. Warning bells went off by late summer that charter supporters could suffer a crushing defeat at the ballot box. Poll numbers at that time were trending down. Although proponents were better financed, opponents were winning the battle of converting the undecideds by sticking to a simple message: more charter schools would drain money from traditional schools. And they were armed with a ready-to-go ground game led by teacher unions with members in every community and more than 200 school committees willing to take public votes against a cap lift. In the end, 62 percent of voters rejected the question, while 38 percent supported it. Not everyone believes future efforts to raise the cap are dead. Some advocates point out that many elected officials who support charter schools opposed the measure because they believed charters would grow too much too quickly. The ballot question would have allowed up to 12 new charters a year statewide regardless of any caps. A more modest proposal in the Legislature could be more successful, they said. The vote hasn’t halted charter school growth entirely because many communities have not reached their state-imposed limits. But several cities are near or at their caps. Boston, for instance, has room to add only 250 seats for next fall. In Georgia on Tuesday, voters rejected a constitutional amendment to allow the state to seize control of chronically failing schools. But there have been successes. Voters in Washington State, for instance, approved a law to establish the state’s first charter schools in 2012, after three previous measures had failed. In Massachusetts, charter school supporters repeatedly had threatened to take expansion efforts to voters if they didn’t get their way in the Legislature. Supporters resorted to the tactic seven years ago and then dropped it after lawmakers agreed to double charter-school enrollment in the lowest-performing districts. Marc Kenen, executive director of the Massachusetts Charter School Association, said Wednesday that advocates have no regrets about pursuing this year’s ballot question, but acknowledged it is unlikely the Legislature will take up an expansion bill in the near future. “We are so committed to helping families who need better educational opportunities for their children that we have to try everything we can,” he said. Kenen said he thinks the vote failed by such a large margin because opponents framed the debate as a choice between charters or district schools, and that voters perceived that charters might do financial harm to their own schools. Advocates attempted to blunt the debate on the funding issue by airing ads saying that charter schools would provide more money for public education. That tactic was a bit misleading. While school systems receive a limited amount of state reimbursements for students who go to charter schools, districts need to find other ways to recoup the money that is lost when per-student aid follows students to charter schools. In an era when many communities statewide have approved tax increases to support the rising cost of education, the message that charter schools drain money from local schools appears to have resonated with many voters. Eileen O’Connor, spokeswoman for Great Schools Massachusetts, which was behind the ballot question, declined to comment Wednesday on the vote. Union leaders said Wednesday they hope the charter debate will provide momentum to stalled efforts to revamp the state’s school funding formula and provide more money to schools, especially in urban areas where schools are serving large populations of students who are poor or those with significant disabilities or limited fluency in English. “It does generate a conversation that needs to continue about education funding and what we want our schools to look like,” said Barbara Madeloni, president of the Massachusetts Teachers Association. James Vaznis can be reached at jamres.vaznis@globe.com.